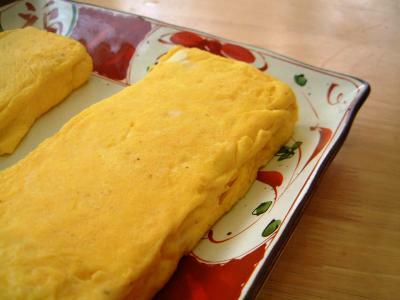 I’ve been asked of late about the basic recipe for “Tamagoyaki”, or Japanese traditional omelette. 1) the slightly difficult one with chopsticks I’m going to explain today. 2) the easier one, but not traditional way, using European/American tools, which will become another report. Incidentally I will write a post about presentation, too! For the traditional recipe,you will need a long pair of chopsticks and a non-stick frypan. 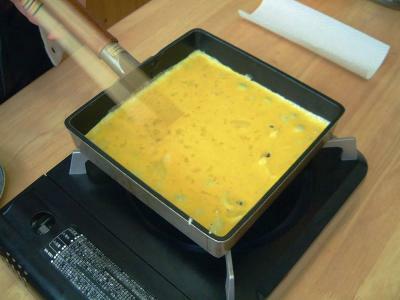 Traditional or not, the fry pan will have to be rectangular or square and of a size adapted to the number of eggs used. Pour in a bowl all the eggs, dashi, sugar and salt. Mix with a whisker. Do not mix to perfection. This will leave some beautiful white patterns in the omelette. First heat frypan well. Pour in a little oil and wait until it starts “smoking”. Do not forget the whole process is done over a strong fire! Get a piece of kitchen paper impregnated with oil handy for the next step. First pour in half of the eggs. 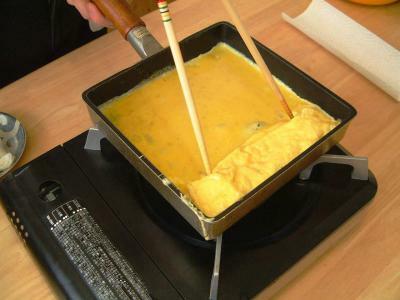 As the omelette cooks burst any air bubbles open with chopsticks to obtain a uniform cooking. 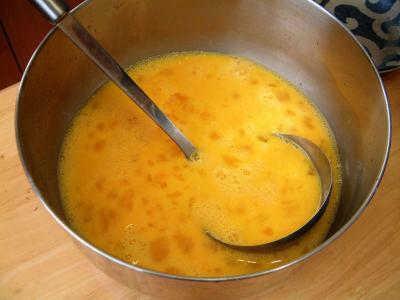 Fold in eggs from the far end towards you little by little, bursting bubbles open at the same time. Do not worry too much at this stage if you miss some of them. Try and proceed as quickly as possible. Keep folding in at your pace until all eggs are rolled in. Away from the fire, wipe the vacant space wit the oild paper, pour in a little eggs.From now on the new egg layer should kept thin. Burst bubbles open as the eggs cook. 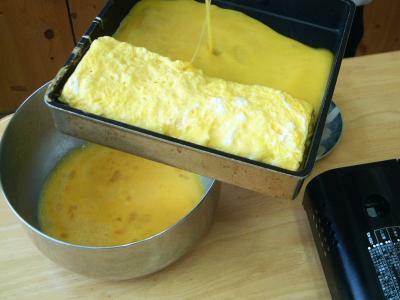 Fold each layer around the omelette by turning it aver towards you, let it slip away from you, brush some oil in, add a new layer of eggs, cook and fold, and continue until all eggs are used. Remember that all should be done over a high fire. It would be easier to do over a low fire, but then the eggs will not be as light and “fluffy”. Eat hot or cold. Can be cut in all kind of shapes for presentation, salads, or maki. The Japanese also mix the eggs with raw shrimp of fish paste to attain an even lighter and thinner omelette. from where did u get the pan? You saw Jiro Dreams of Sushi? (not a great movie, btw)…what makes his tamagoyaki so cakey? Grounded shrimp, like in datemaki? Also, it wasn’t rolled, also cooked flat in the pan…any idea? 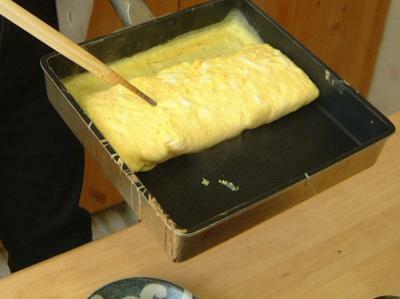 This particular type of tamagoyaki is a very different type of recipe. 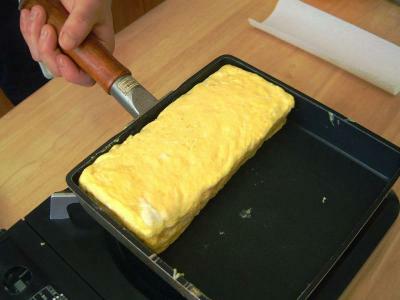 Whereas usual tamagoyaki is fluffy because it contains only eggs and dashi 8 or water, etc…), this type of tamagoyaki is mixed with raw prawn paste and it cooked slowly into a flat sort of pancake. If you want the full recipe please tell em!